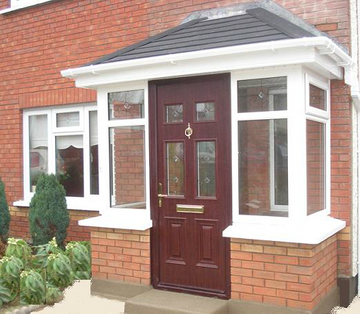 Porches custom built to your specifications. 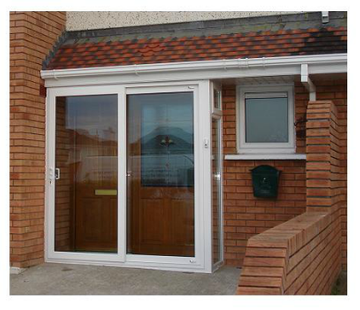 Porch extensions are a sensible and affordable building option for home owners. With such an extensive range of designs available, we’ll be able to design the perfect porch solution for your property. Our porches are made using the very latest building techniques which prioritise quality craftsmanship and energy efficiency. 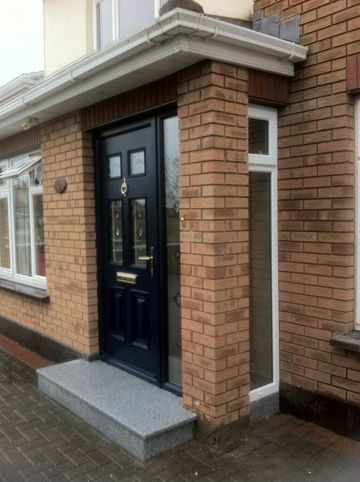 Most Irish buildings are finished with a traditional exterior like red brick, render finishes or dashed finishes. Our extensions match the traditional exterior of buildings, seamlessly blending the extension with the older part of the property. We help clients find the right porch finish to blend with the unique aesthetic of their property. 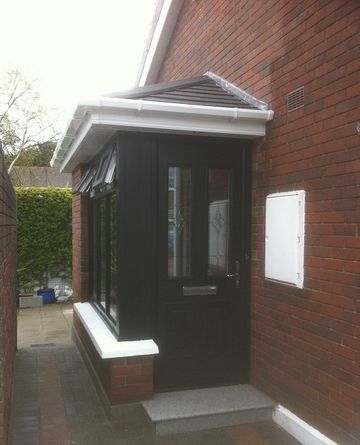 For advice on the right finish on your porch extension, get in contact with A Gilligan Builders today. This porch in Lucan was an addition to a modern two-storey dwelling. The client wanted more storage space at the front of their property. In conjunction with the client, we came to a decision on the right kind of finish to compliant the existing property’s aesthetic. 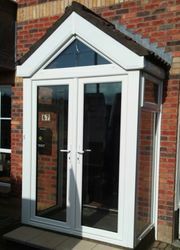 White uPVC Double Glazed Security Windows with a French Door arrangement was fitted. 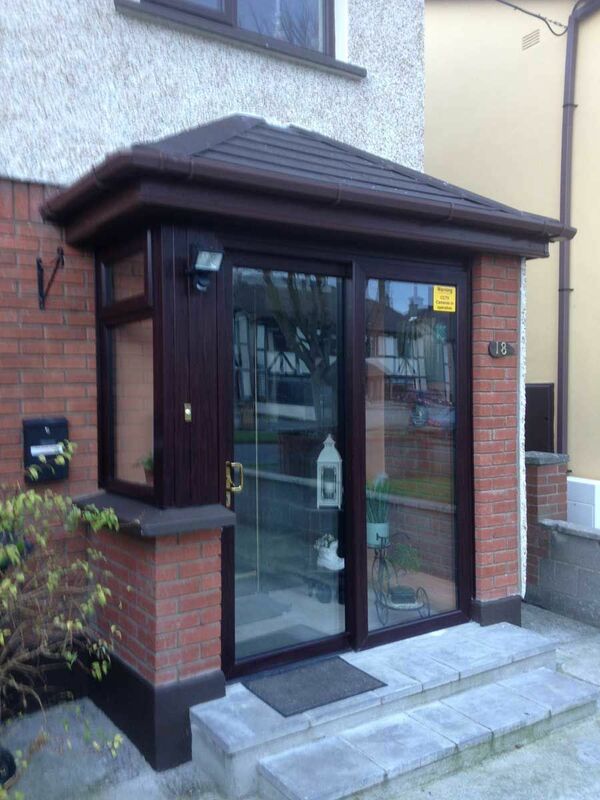 A solid roof with a Rosemary Roof Tile finish was also installed. A Gilligan Builders also installed 2 down lighters in the ceiling. Externally we installed a double electrical socket for lawnmower and Christmas lighting. 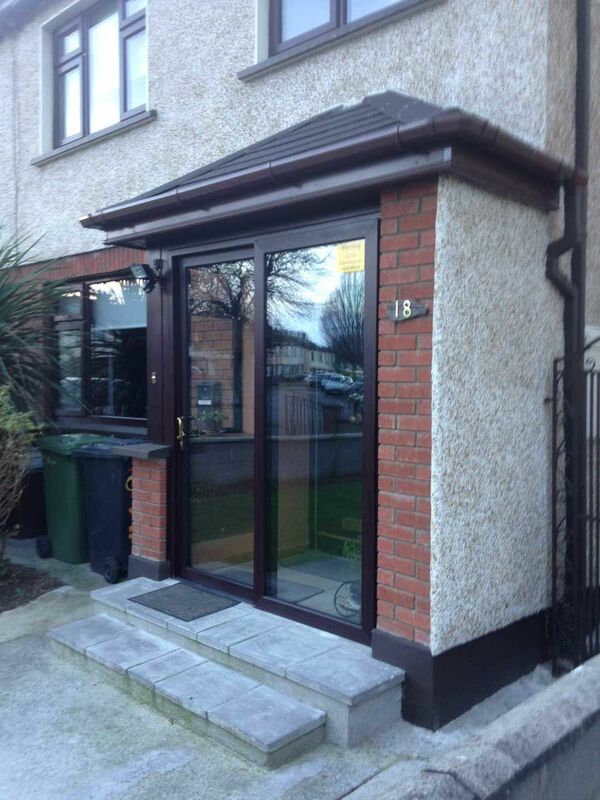 This Porch extension was completed at a semi-detached property in Lucan Dublin. This type of conversion will be completed in 2 days. 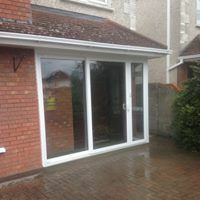 French doors with two side windows on insulated slab under existing canopy. Double glazed safety units with angled bevelled glass to roof space, Multipoint Locking Systems with anti-snap barrel. 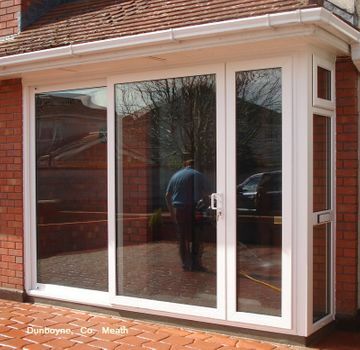 This elegant addition to any similar home will offer complete security with added insulation value. Porch Conversions completed under existing canopies using two and there part Patio sliding door systems will be completed in two days with the minimum of disruption to your home. They will offer the homeowner complete security, reduced heat loss and are great value for small investment. Please ask to speak to our previous customers. This house in Dunboyne had an existing canopy. 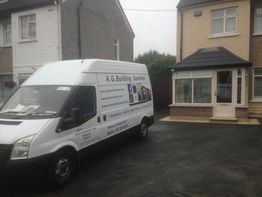 We removed part of the brick paving, formed a new floor with a damp proof membrane and installed a Three Part Patio Sliding Door System. We added a return window with modern ventilation. The floors were tiled with a non-slip tiling solution. We also installed two down lighters. The property owner was seeking a complete weather resistant space that could be used for storage. The homeowner was extremely security conscious. To ensure absolute energy efficiency we installed insulated brick with a hipped lean roof. We installed sturdy uPVC gutters, fascia and soffits. The reinforced concrete used was painted to blend seamlessly with the existing property. As security was a concern, we installed Rehau uPVC internally glazed security windows along with a Palladio Composite Security Door to act as the main entrance. The interior was dry lined, with a smooth plaster finish. A storage press was created at the end for everyday items. Down lighters were installed internally and externally. Floors were tiled with a non-slip tile design chosen by the customer. 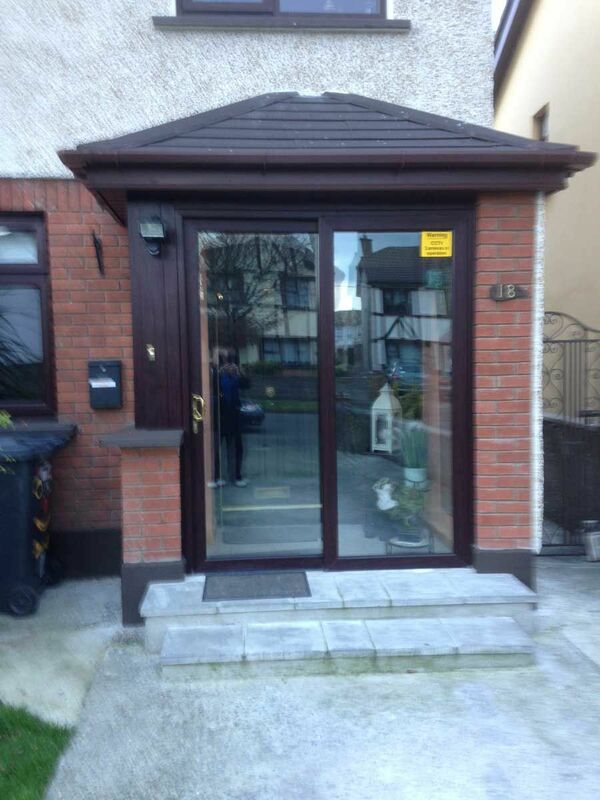 This Porch extension was an addition to a home in the suburb of Baldoyle Dublin. 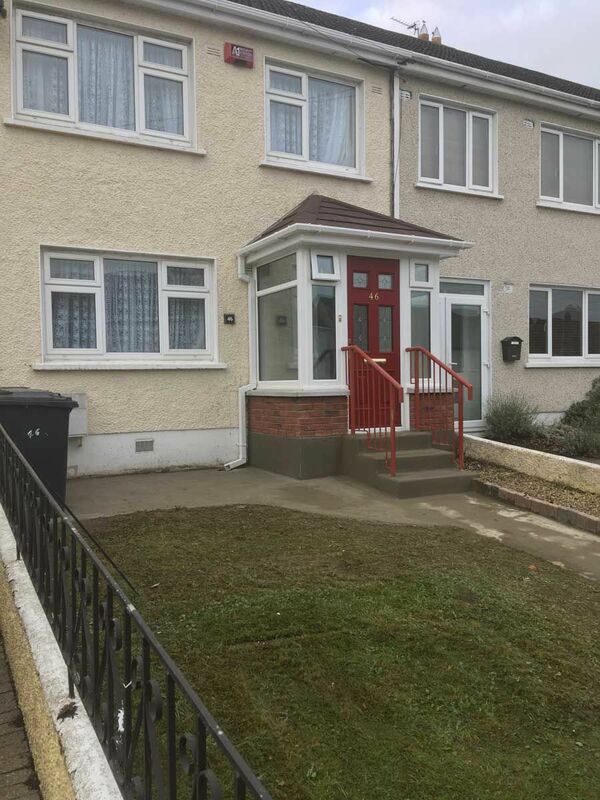 With its original limed wet dash finish the property just needed a small porch extension. 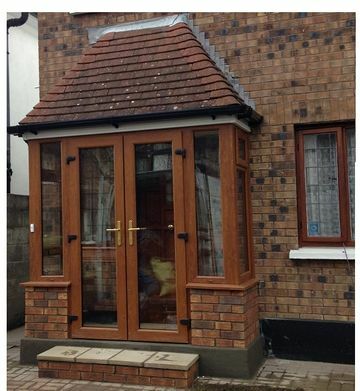 We designed and constructed this porch to fit in with the original property. White uPVC windows and doors were supplied by Weatherglaze Designs. A solid roof structure trimmed with white uPVC, shingle sheet roof coverings all fully insulated is used externally. Walls are of cavity construction dashed externally to match existing walls. 0ur electrician fitted down-lighters internally and externally. A gas meter at this home had to be moved to allow for New Porch construction, this build was finished in 8 days, as always, debris removed, shingle and paving replaced. The Professional Couple just had to turn the key. This end of terrace home in Swords, Co Dublin had an existing canopy. We provided a new reinforced base with, rising brick walls to match bricks as near as was possible. 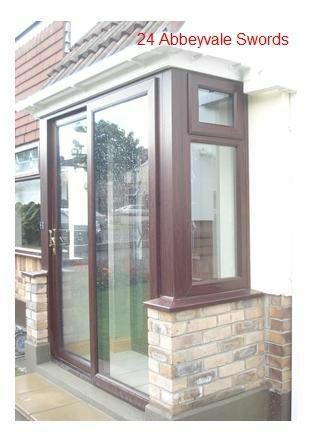 Rosewood Double Glazed windows and French door arrangement by Weatherglaze trimmed with white uPVC fascia’s and soffit. The floor interior was tiled. New lighting was connected to the existing supply. A neat little extension for a small investment. Another example of a porch addition to a home in Clontarf. The requirement was to provide security to the home. Using the existing canopy this light oak French door uPVC double glazed window arrangement works very well. The porch walls are constructed with bricks sourced from Outhaus and are almost identical to the ones used in the construction of the original house. The foundation has been excavated to regulation depth and width and a damp-proof membrane inserted in the base and walls. The overall porch allows for easy access with an airy open feel. The existing front door can be opened with the knowledge that you are secure and safe. This type of conversion is very affordable and can be completed in around 4 to 5 days. This Security Porch was designed and built to compliment a modern day two-story dwelling. The main concerns for the couple living here were that it complimented their home and was secure. This construction has a new concrete slab foundation. 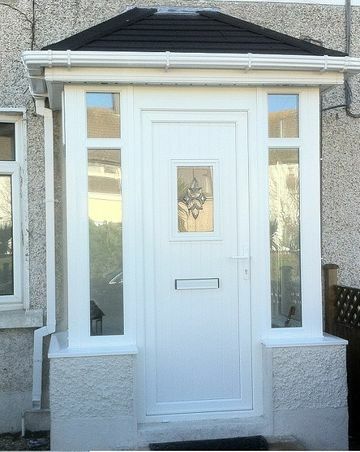 A-rated white uPVC windows and a Palladio Composite Door supplied by Composite Door Systems. The Guardian roof is streamlined and robust. The bricks used in the construction of this porch were sourced in Dublin and matches the existing walls of the home very well. When sourcing bricks, it is advisable to remove an original brick from where the new porch will join the house. All the details should be written down and signed off by both parties. 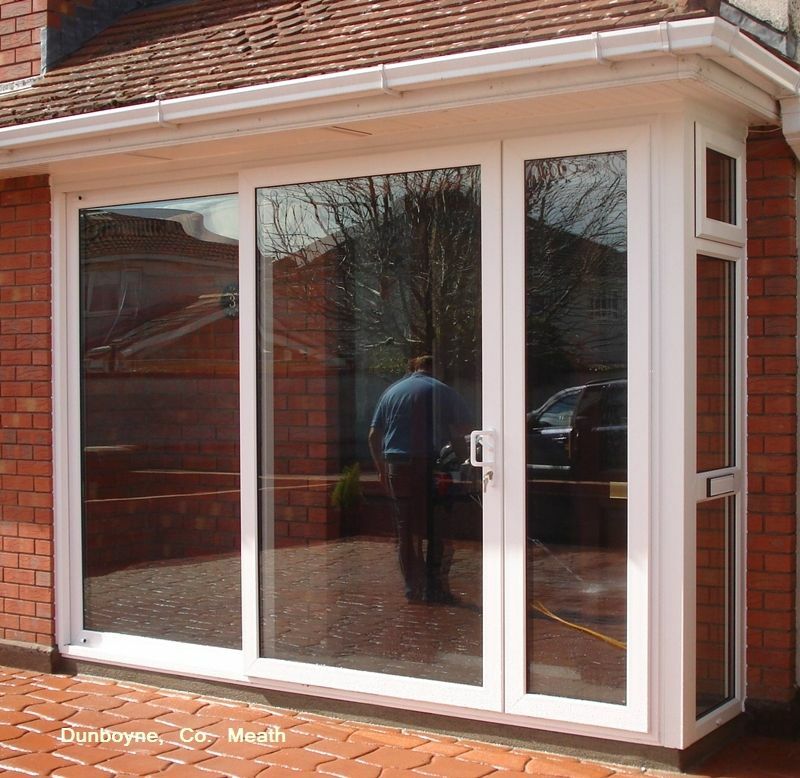 All our porches are designed to accept double or triple glazed units. This design works very well and can be completed in 7 to 8 days. 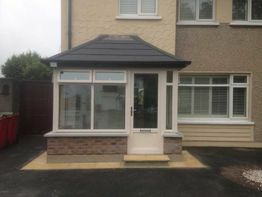 This porch extension is at a private dwelling in Dunboyne. The constructed by using the existing canopy and we then raised the floor level to match the floor in the hall. 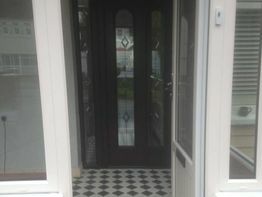 The installation of a Palladio Composite door provides excellent security. 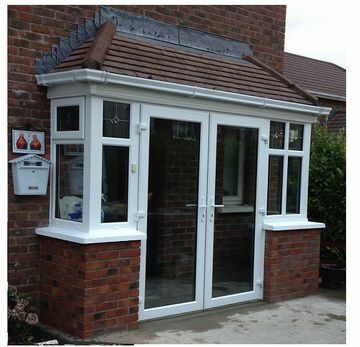 To enhance the light in the porch we installed a white uPVC double glazed window. The interior walls has been dry-lined and finished with two coats of fine plaster. 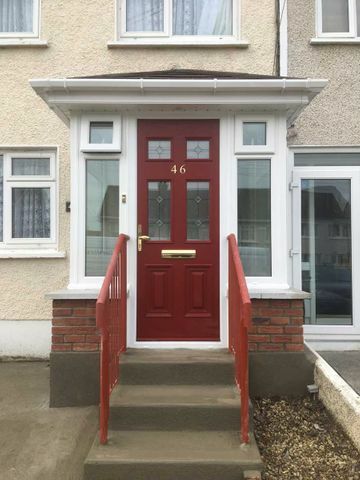 We have installed internal and external down-lighters to enhance the appearance of the porch. 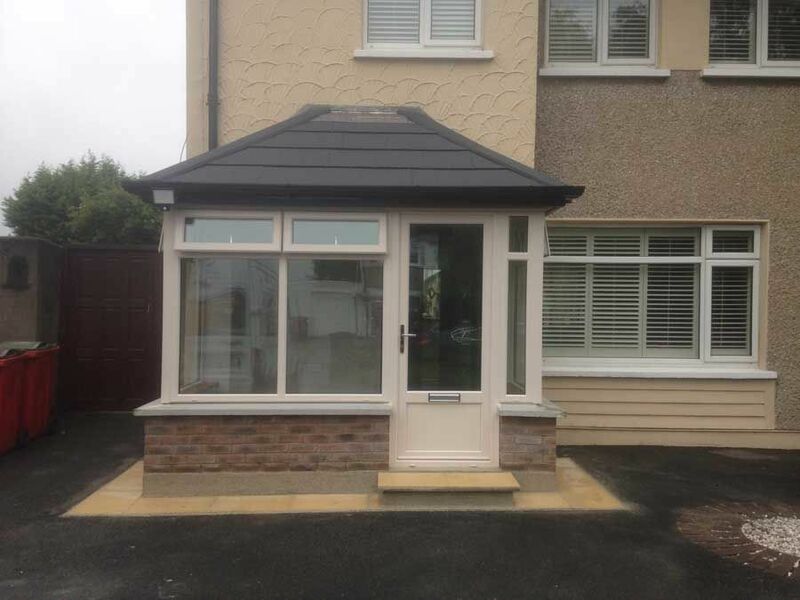 Have us design the perfect porch for your requirements, get in touch with A Gilligan Builders today for a free quote today. 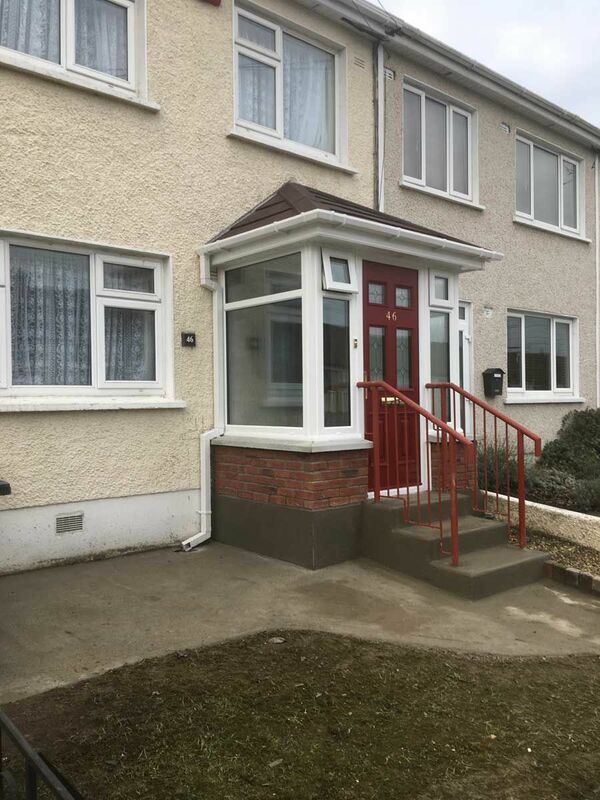 This Porch extension at St Canices Road Glasnevin Dublin offers additional space and security to this Detached property. We used a rustic old style red brick in rising cavity insulated walls, Cream uPVC double glazed windows, hipped leanto roof with Guardian roof coverings. The Porch was dry lined and plastered. We fitted a Palladio Security Composite door internally, floors were tiled with tiles of customers choice, low energy down light fitted and security light externally. Job was completed in 10 days as previously agree with Nuala and Paddy. This Porch extension was an attractive addition to this semi-detached home at Riverdale road Clondalkin. We used brick to match existing in our cavity wall construction, Rosewood uPVC Patio Slider and security Glazed windows with multipoint locking systems, Dry Lined and plastered internally with a Canterbury spa dash externally to match existing, floors tiled and low energy downlights. We installed a security light externally all completed in 8 days.